Hey, Future beyond fit family member! You are going to crush the next four weeks. 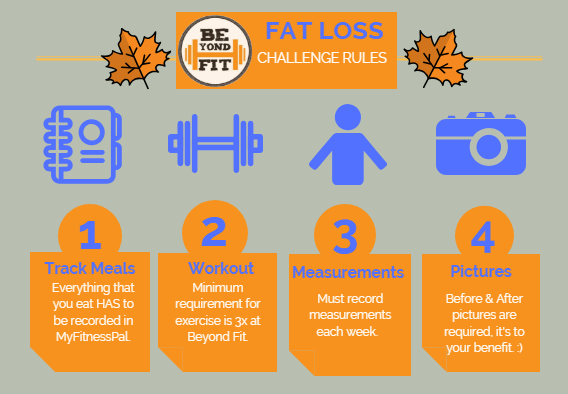 Remember this is a challenge to lose the most body fat in 4 weeks. We will donate $25 from every entry fee to Aidan's Avengers. If you are tired of trying to figure out how to eat well or tired of putting recipes together for the week, we are offering our Phase I meal plan. This meal plan comes with an entire 6 WEEKS of meals (what to eat, when to eat and HOW to make it) as well as a recipe guide so you know EXACTLY how to make your meals. (different from the most recent Phase I 6 week manual). The meal plan manual WILL definitely ensure your success in this program. Our members have seen some truly amazing results from incorporating the program into their daily routine. select a program option and click the "Buy Now" button below to complete your registration. What's in the meal plan?! If you're interested in the meal plan and would like to know a little more about it, then click the link below to check out a quick 2 minute video.